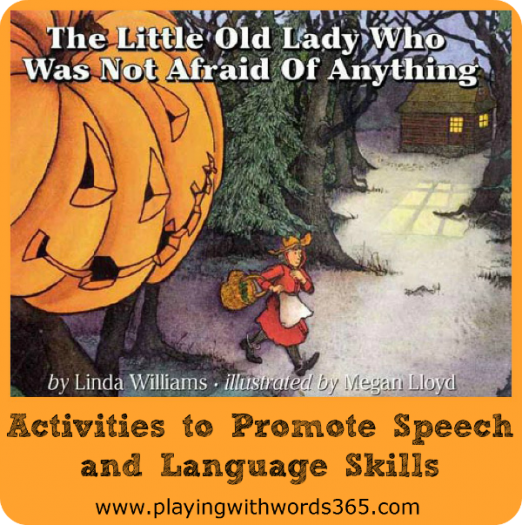 My ALL TIME most FAVORITE fall book is (Affiliate link->) The Little Old Lady Who Was Not Afraid of Anything by Linda Williams. As a speech pathologist, I use this book with my preschool students up through about first or second grade to work on listening, answering “wh” questions, sequencing, etc. As a parent, I actually started reading it to my daughter right before she turned two (since her birthday is the end of November), but I modified the story line (I simplified it to keep her attention). This book is about an old lady who goes into the woods for a walk, and on her way home meets several spooky things that try to scare her. Because she is, after all, The Little Old Lady Who Was Not Afraid of Anything, she continues on, telling them all she is NOT afraid, even as the different things follow her all the way home. My favorite part of this book is the fact that each item she comes across (boots, shirt, pants, hat, gloves, and pumpkin head) each make their own “sound” which I also pair with body movements. Little ones LOVE THIS! And I am a huge advocate for employing ALL the senses whenever possible, in my lessons (and while playing with my daughter). Read the book yourself before reading it to your child to get a sense of the characters and tone of the story. Read the book with ENTHUSIASM! If you act interested, your child will be too. As the book goes on and the Old Woman begins to walk faster and faster, you can slowly speed up how fast you are reading. Usually after she meets the Pumpkin Head I start reading very quickly until she gets home! Shoes: The shoes go clomp clomp. When I say the clomp clomp, I lower my voice and elongate the words, like “clooooomp, cloooooomp”. At the same time, I stomp my own feet and encourage the child(ren) to do the same. Pants: The pants go wiggle wiggle. When I say the wiggle wiggle, I speak in a slightly higher voice. At the same time, wiggle my whole body. Shirt: The shirt goes shake shake. When I say the shake shake I say it quickly. At the same time I shake out my arms (like shaking out clothes from the dryer). Gloves: The gloves go clap clap. When I say clap clap I kind of sound like a duck (I don’t know why I picked that voice! HA!). At the same time I clap my hands. Pumpkin Head: The head says boo boo. When I say the boo boo I usually say it louder, and short. Rather than a body movement, I make a surprised face, like I am a little scared. Retelling the story (book): After reading the story a few times, see if your child can “read” the book to you, retelling the story. Retelling the book (“felt board”): You can print out images for this story at Making Learning Fun dot com and have your child retell the story with the images. (These can also be printed onto felt to be used on a felt board, but you can just use the paper images the same way). Act out the story: Have your child act out the story. Pretend to be the Little Old Lady (your child can even dress up as the little old lady!) and go for a “walk” in the woods. You can use real clothes and a pumpkin, or just pretend! Make a “real” scarecrow: If you have extra clothing items around (or find the items at your local good will), use newspaper, magazines, and/or hay to stuff the shirt and pants and attach the gloves with pins and use a pumpkin as a head. It would be a GREAT decoration for your front porch this Fall! Make a paper scarecrow: You can print out and have your child color and glue a paper scarecrow (see picture above) out from Making Learning Fun Dot Com. Added resource since I originally published this post, check out the adorable LARGE printables at ToddlerApproved! LOVE THEM!!! But you didn’t scare me! I too love using books in therapy. This is one of my favorites and I do similar activities. I use it every year and just put the cover and “characters” outside my door along with other Halloween activities. I also read “The Spider and the Fly”-so many things you can do with that, and “Pumpkin, Pumpkin”. Do you have Mailbox Magazine at your school? It’s a wonderful resource for book activities and teaching other language skills. This (The little old lady….) is my favorite book of all time, I think. I look forward to October for this book. Did you know-there is a song to go with the book. It’s by Mar Harmon. Music with Mar is the CD title. but if you google Music with Mar-you get her website–and right now she has a video of her and some kids performing the litle old lady song. Wow! What an informative and helpful post for parents and teachers! Thanks so much for linking it up to our 5-a-Day Books challenge! Thanks Anna!! I LOVE your book challenge! Thanks so much for stopping by!